In the early years of the internet, it was revolutionary to have a world of information just a click away from anyone, anywhere, anytime. Many hoped this inherently democratic technology could lead to better-informed citizens more easily participating in debate, elections and public discourse . Today, though, many observers are concerned that search algorithms and social media are undermining the quality of online information people see. They worry that bad information may be weakening democracy in the digital age . The problems include online services conveying fake news , splitting users into “ filter bubbles ” of like-minded people and enabling users to unwittingly lock themselves up in virtual echo chambers that reinforce their own biases . We sought to learn directly from people about how they used search engines, social media and other sources of information about politics. Through funding from Google, we conducted an online survey of more than 14,000 internet users in seven nations . We found that the fears surrounding search algorithms and social media are not irrelevant – there are problems for some users some of the time . However, they are exaggerated, creating unwarranted fears that could lead to inappropriate responses by users, regulators and policymakers. That leaves the least politically interested people and the least skilled internet users as most susceptible to fake news, filter bubbles and echo chambers online. These individuals could benefit from support and training in digital literacy . 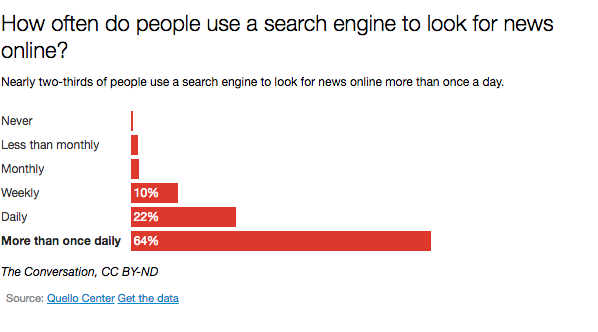 Internet users generally rely on a diverse array of sources for political information. And they display a healthy skepticism, leading them to question information and check facts. 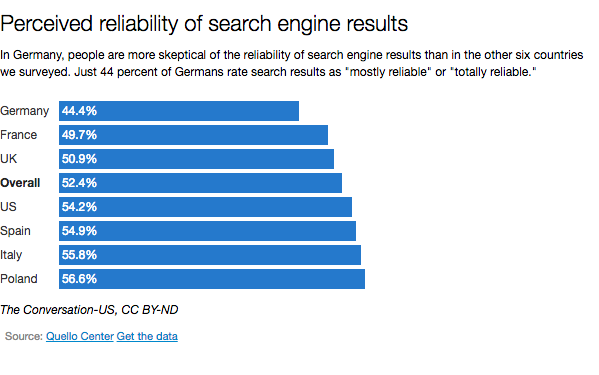 Regulating the internet , as some have proposed, could undermine existing trust and introduce new questions about accuracy and bias in search results.